Do You Have the Scariest Place to Pump at Your Job? Does your workplace have a totally lackluster place for nursing mamas? If so, enter this contest, which turn the "scariest" pump room into a haven. Moms have enough to worry about when they head back to work after maternity leave—how their children will fare without constant mother/child bonding, whether they'll miss those crucial milestones, how they'll function on little to no sleep, to name a few. 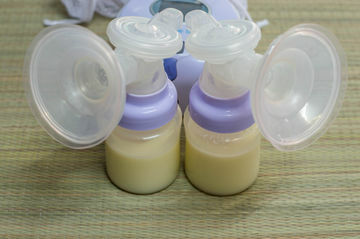 But for so many moms out there, returning to work comes with a rude awakening they may not have even considered: the prospect of pumping breast milk in a cold, dank, depressing, uncomfortable, outdated, unhygienic pump room. The team at baby bottle brand Tommee Tippee knows how many working moms face thoroughly undesirable pump rooms day after day, and they've decided to do something about it. The brand joined forces with Scary Mommy to hold a "Scary Pump Rooms" contest—all you need to do is upload a photo of the less-than-ideal place where you're forced to pump breast milk for a chance to win big. The two brands will select the four pump rooms that appear most in need of makeovers and ask the public to choose the scariest room of all. The "winning" room will get a full-on makeover—and which working mom doesn't want to pump in a clean, comfortable room? "Our biggest goal as an organization is to make life easier for parents in whatever way we can. We have quite a bit of contact with our consumers and this is one of those areas that seemed rather overlooked," Sharon Swan, the director of North American marketing for Tommee Tippee told Fit Pregnancy. "I personally was pumping in a dirty room that had a door that didn’t lock and a broken chair. Some people are lucky enough to have beautiful pumping rooms, but the more you talk to other women [having a room that needs some work] is the commonality, unfortunately. I think it’s just one of thosethings that gets overlooked until somebody shines a light." While only one pump room will win a makeover, Tommee Tippee hopes the contest will inspire conversation about how much work most pump rooms need. The brand is hoping other companies will become more aware of the issue and take an online pledge saying they'll do what they can to improve their pumping spaces. The first 100 companies to take this vow will receive some swag (including Tommee Tippee bottles and pumping equipment, motivational posters and more).